Grilled cheese! These words alone should have you sold on the idea of buying a raclette grill. I feel like I can now put my pen down and publish this article. Grilled cheese! What’s not to love about that? But a raclette is so much more. It brings closeness and bonding to a romantic date and fun and excitement to dinner parties. And although these grills are most famous for the beautiful sight of pouring gorgeously gooey cheese over bread or jacket potatoes there are many different foods you can cook. So I’ll not put my pen down and instead write a complete guide to the best raclette grill for a range of different entertainment occasions. GoShindig is a site all about having a party, so what better place to start than the best raclette party grill. In general the whole raclette experience is deemed to be one geared towards entertaining friends at dinner parties or other small gatherings where food will be involved. So you could say all raclette grills are party grills. And you’d be right, but for this section I’ll be recommending the bigger raclettes that are designed for at least eight people (raclette companies recommend the number of people a grill is for based on the number of trays that come with it). 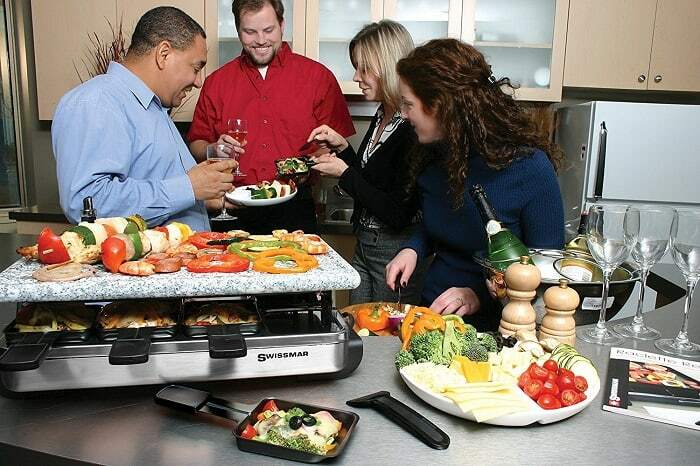 Our top recommendation is the Swissmar 8-Person Raclette Party Grill with Granite Stone Grill Top. Swissmar is the number one company when it comes to raclettes and is a name that’s fast becoming synonymous with quality raclette grills. This grill comes with a granite stone grill top but they also have the same model available with a cast aluminum non-stick top which is a little cheaper if that’s what you prefer. Teflon trays – So machine washable and non-stick which allows cheese to easily slide off. Grooved granite top – Stops juice or fat tripping into the trays below. Adjustable knob – Set different temperatures based on the food you’re heating or melting. Build quality – All parts are clearly built to last and are of a high standard. Cleaning – Granite top is easily removed and therefore easy to keep clean. Power cord – Too small and you’ll need an extension. Shape – Many 8-person grills are oval in shape to let people on the ends of the table easily return their trays. This grill is rectangular. Here are four more great raclette grills to give you a top 5 of the best raclette party grills. When it comes to features there isn’t much that separates one grill from another, they should all have two cooking areas (one for the cheese trays and one for other items), so the only real difference is the number of people they are made for and the quality of the build. Below is our list of the best-made raclette grills for sizes that aren’t party grills. Raclette means different things to different people, it’s a dish that has been around for so long that there is now many different takes on what makes a good raclette. Raclette is a dish from Switzerland and very popular in countries surrounding Switzerland. Raclette is also a type of cheese, but in the context of this article raclette is a dish of several foods that accompany melted cheese. And the modern way to melt this cheese is to use a raclette grill. 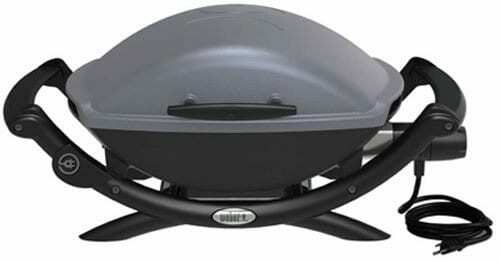 The grill is normally a small electric table top appliance that has two cooking areas. One area is where cheese is melted, and all good raclette grills will come with little trays to aid with this. These trays are known as coupelles in French but would very rarely be called this by English speaking users, where raclette tray would be commonly used. The second grilling area would normally be a standard flat grill surface where users will cook items that are to accompany the cheese. The first time I had the joy of experiencing raclette was when I was holidaying in Mont Blanc, very close to the home of raclette and a mountain range that spills into France, Italy and Switzerland. So you can imagine the great quality and choice of local cheeses and cold cuts of meat I had available to sample (I was also with a friend who was a local of the region and could guide me into making all the right choices). And this is what raclette is to me. But not everyone is lucky enough to have enjoyed the more traditional raclette in its region of birth, so have different expectations. Reading online reviews from people that have purchased a purpose built raclette grill shows that people that aren’t happy with their purchase will normally be complaining because the grill doesn’t get hot enough (they can’t sear their steak or it takes forever to grill a chicken breast). These people clearly don’t understand what a raclette grill is for and should probably follow my advice for raclette grill alternatives. In fact there are probably many people reading this article where my alternative to a raclette grill will be more appropriate. So are you like the guys moaning about not being able to cook larger chunks of meat to go with the melted cheese, someone that would like to enjoy raclette out camping or at a festival, or are you wanting a grill that’s great for BBQ evenings as well as raclette dinner parties? Then you’ll more likely benefit from my alternative to a raclette grill. It’s simple, buy a portable BBQ grill! If you want to stick with the grill being electric then you can buy one of the Q series grills from Weber. These grills will give you a lot more power than the average raclette grill and will also allow you to BBQ steaks, burgers and hotdogs. Or you can get the Weber Go Anywhere grill, that’s available in both gas and charcoal format, and as the name suggests, gives you the ability to go anywhere with it. 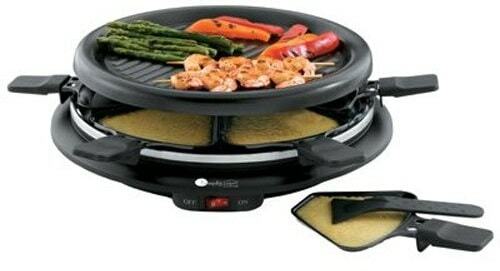 Which means you can use it as a raclette anywhere (obviously don’t use the charcoal one indoors). Now all you need is the coupelles (small trays for the melted cheese). You could buy replacement trays, like these ones available from Swissmar, which would be perfect for the job. But better alternatives, due to them being more flexible, is to buy several one egg frying pans – like these ones from T-fal. Or if you are someone that goes camping a lot you might prefer these cast iron skillets from Lodge. And if you’re a fan of tapas, you might prefer these individual terracotta dishes that would be great for melting cheese and for tapas dishes such as gambas pil pil. 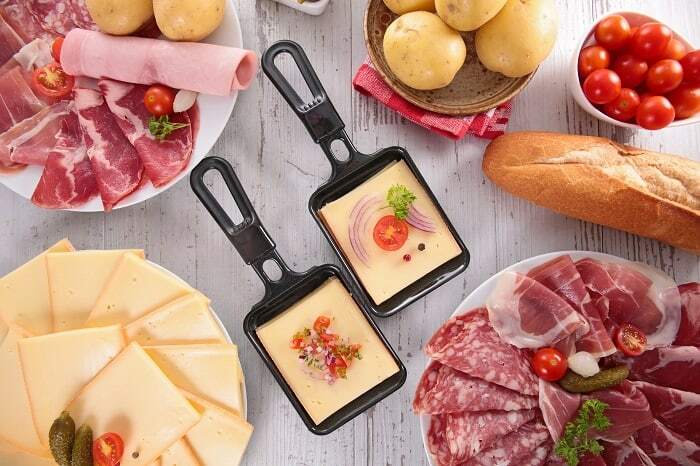 The main reason for a raclette grill is to grill cheese, but you can do a grilled cheese on toast with a multitude of different kitchen appliances, so a raclette needs to offer something different to make it a worthwhile purchase. And it does. It brings the entertainment of communal eating and cooking, a bit like the fun you had as children around a campfire with marshmallows on sticks – but more adult. The slow cooking and sharing of a buffet of food is a great ice breaker. It also allows time for catching up with friends and gives people plenty of chance to enjoy a drink. As it’s not a formal or structured dinner party, raclette also gives people the opportunity to pick at the food they like, leaving the bits they are less keen on. Raclette also allows guests to eat at a pace that suits them. With a multitude of different designs, it’s actually surprising how similar all raclette grills are once you break it down to individual components that make up the grill. So what should you be looking out for once you decide to buy one? Price is extremely important to everyone when deciding on a purchase, and buying a raclette should be no different. Especially considering this is an appliance that’s not going to be used every day. 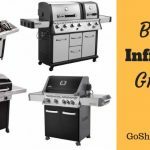 Thankfully, these grills are all reasonably priced – you can get decent grills starting at $30 and the top end grills aren’t super expensive either. It’s a case of each to their own when it comes to which size to buy. You’ll have to ask yourself what you intend to use it for. If it’s just for a romantic meal for two then no need to go particularly large. Whereas if it’s for a dinner party then you’ll need one with at least eight coupelles. Non-stick Surfaces – You’ll want non-stick coating on all cooking surfaces. The most common would be Teflon or ceramic coating on both the grill top and the coupelles. Granite Surfaces – Granite is often used on the more expensive raclette grills. This type of grill top provides a more evenly spread heat source, but grills with granite will not get as hot as other grilling surfaces. These type of grills are more for keeping food warm than for cooking. So stay away from this material if you plan on grilling raw meats and veg. Whenever I see complaints about raclette grills, nearly all of them revolve around the heating – either it doesn’t heat fast or hot enough. So if you want to stray from the more traditional raclette, be sure to check it has variable heating that will go to a heat you require. The little cheese trays are likely to come with any decent raclette you buy, but you should still make sure. You’ll also want to be supplied with one spatula for each of these trays which will be needed to scrape out the contents. Another great extra to look out for is modular or reversible grills. These are grills that can either be changed or flipped to give a different cooking surface. There is no rock science behind raclette maintenance, all you need to do is give them a clean after every use. So it’s best to buy one that has dishwasher friendly trays (if you have a dishwasher) and one where you can remove the top grill so you can easily wash it in the sink. Firstly, read the instructions before you do anything and then assemble the raclette grill according to how it’s suggested in the instructions – remember not to have the grill plugged-in at this point. It’s advisable to inform any children that the grill will be hot and probably best to keep very young children away from the grill and make their food for them. Before turning the raclette on, and even if you have just bought it new, it’s best to give the cooking surfaces a quick clean. Before putting any food on the grill you should first pre-heat the raclette. Remember that some of the more traditional raclettes will not get very hot as they as mainly used for melting cheese or warming food. Variable heating grills can get pretty hot however, so make sure the area around the grill is free from anything that may melt because of this heat. It’s not recommended to put oil or a non-stick spray on any of the cooking surfaces as this will normally burn and the surface should be non-stick already. Now, you simply fill the little trays with some cheese (and any veg you may want to go with it) and then place these in the area provided. Any meat you wish to cook on the bigger grilling area will be cooked just as you would on the stove. I’d recommend getting a thermapen if you plan to have your guests cook large chunks of meat or any chicken as you don’t want people to poison themselves. If you have read this far then you’ll definitely know that cheese is great to cook/melt on a raclette, but what other items will you commonly find people cooking? Potatoes – Traditionally potatoes are a staple when hosting a raclette dinner party. I recommend new potatoes, and that you finely cut them, boil them and then rinse under cold water before placing them on the table for guests. Vegetables – It’s best to pick tender vegetables such as mushrooms or zucchini as these are easier to cook. Or you could offer veg that is tasty when raw, such as diced onions. Meat – Pre-cooked meat such as ham or saucisson is best if your grill doesn’t get very hot, but if it does then you can add any meat to your buffet. I’d recommend having the meat finely sliced so that people aren’t waiting for ages for stuff to cook. Fish – Fish is very fast cooking compared to other meats which makes them ideal for raclette. Fatty fish such as salmon and catfish are raclette favorites – Shrimp is also a very popular choice. Chocolate – That’s right, chocolate. Raclette can also be used for desert. S’mores is a very common choice, melting marshmallows and chocolate is the sort of thing the raclette was made for. If none of the ideas above helps then you can find plenty of raclette recipes online, a couple of great examples can be found on Raclette Corner or Yuppie Chef. When buying a brand name you know that part of the price is simply because of the name, and not all down to the product itself. But often searching out a particular brand name brings with it a guarantee of buying a quality piece of equipment. This peace of mind is normally worth the few extra bucks. In the raclette marketplace there is one standout brand you can safely buy without doing any research in the knowledge you’re going to get a top quality grill. That brand is Swissmar, they have several different and great raclettes. 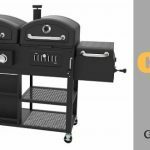 There are several other companies in the chasing pack that also make great grills (we have them listed below) but you’ll have to do a little more research on each product. Swissmar is an expanding company that’s renowned for its quality raclettes, fondues, wine accessories, bamboo boards and cheese knives. They are a well-established company with a mission of bringing affordable prices to the gourmet food market. Swissmar is by far the best raclette grill brand. You’ll find Hamilton Beach products in most homes across North America. They supply 35 million small kitchen appliances to Canada, USA and Mexico each year. West Bend celebrated 100 years in business in 2011, it’s crazy to think they have been around that long. And as you can imagine, in that time they have been involved in many different products. From bread making, smoothie blenders, pizza ovens and of course raclette grills. Milliard is one of the new kids on the block, and hopefully continue with their impressive range of products. They started out as a candy firm in 2009 but have grown to make and supply a wide range of goods, and have recently ventured into making raclettes. You mentioned that most customer complaints concerning raclette grills are that they don’t heat high enough, but didn’t say if there is any solution to this. We have bought 2 raclette grills to replace ours that went out, and both of them have failed to heat properly. They heat only enough to barely warm the cheese after 15+ minutes, not grill or even melt it. One of them was a US appliance with 110v, and then on our last trip to Europe we got one in Belgium (220v to use on our stove plug, as we did successfully for many years with the first grill we brought back from Europe). Is there any kind of trouble shooting that can be done in this situation? We still have both grills.